Pastor, author, and speaker Mark Perry addresses the growing holy discontent in the Western church, as millions of believers are longing for something more raw, more real, and more revolutionary than the current state of the church in the West. Drawing on years of experience as a church planter, pastor, and consultant, Perry writes about a refreshing new move of God where the kingdom emerges first, ahead of the church, and where the priesthood of all believers becomes a beautiful reality. With great respect for God's church, the author artfully addresses the 'spots' on the wedding gown of the church and then gets at the core of the holy discontent that is causing millions of believers to leave local churches. But this isn't another book simply describing problems. The tone is entirely positive and hopeful as Perry writes about practical solutions and solid ways forward. The church as a greenhouse, the balance of blessing and building, and so on--these perspectives and others greatly help the reader to understand a major paradigm shift that God Himself is bringing about to infuse fresh life into the local church of the 21st century. Kingdom Churches is a book that will help members and leaders of local churches, as well as those who have long since left the local church, to find their way back to a place of healing and hope. As Perry sees it, there is a new 'recipe' for life-giving, effective kingdom churches, and it's time for the church in the West to 'taste better' than it has for decades! 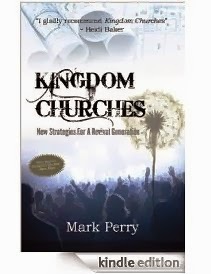 Kingdom Churches is a book that will encourage, inspire, and inform. Every Christian, every church member, and every local church leadership team would benefit from reading this insightful, practical book.